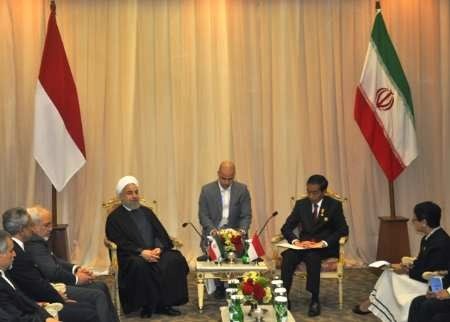 Jakarta, April 23, IRNA – President Hassan Rouhani and his Indonesian counterpart Joko Widodo discussed issues of mutual interest as well as the international developments here Thursday morning. In a meeting on the sidelines of the 60th Asia-Africa Summit Meeting in the Indonesian capital, the two presidents discussed issues of mutual interest, as well as the latest regional and international developments. Rouhani and Widodo called for enhanced cooperation between Tehran and Jakarta on economic issues. According to statistics, Iran-Indonesia trade hit $2 billion dollars in 2012 from $600 million dollars in 2010. However, trade between Tehran and Jakarta once again shrank to $600 million in 2013 as a result of imposition of illegal Western sanctions on Iran. Iranian and Indonesian officials hope that an emerging comprehensive deal between Iran and the six world powers over Tehran's nuclear program that guarantees Iran's right to peaceful nuclear technology and results in a lifting of all sanctions, would lead to a significant rise in trade between Tehran and Jakarta.